The Uptown Collection by Manhattan Comfort introduces the best addition that you can add to your home by far, a swing shelf. Designed with amazing dimensions of 17.52" x 11.81" x 7.48" and Weighs Only 2.2 lbs. it can easily to placed and set up anywhere. 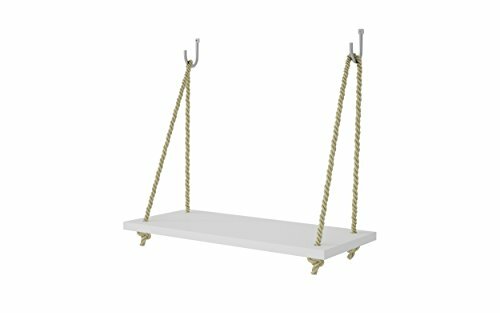 Upon delivery and basic assembly, this swing shelf can immediately be used and enjoyed for a long time to come. Crafted from durable pine wood and a thick 8mm rope, it is without a doubt that this swing shelf will be around in your home for several years to come. Designed with a reclaimed modern design, it can enhance and compliment any home decor. With a maximum weight capacity of almost 7 lbs., it makes practical use for plants or small decorative goods. This swing shelf is bound to add the finishing touches to your home, so what are you waiting for? For nearly 10 years, Manhattan Comfort has been manufacturing products with the best quality. They have been so successful that they are a household name. Through the ongoing process of innovation to sustain customer satisfaction, Manhattan Comfort is dedicated to bring modern stylish furniture of quality to customers everywhere. Durable Craftsmanship: Created From Pine Wood, This Shelf Has Been Built to Last With Nothing Less Than The Best Quality. The Rope is Thick With 8mm, Making it Certain That This Swing Shelf Will Hang and Be Long Lasting For a Long Time to Come. It is Easy to Place and Hang and Can Be Enjoyed Almost Instantly. If you have any questions about this product by Manhattan Comfort, contact us by completing and submitting the form below. If you are looking for a specif part number, please include it with your message. Kenuco 2U Toolless Rackmount Space Spacer Blank Rack Mount Filler Panel for IT Racks and Cabinets, Solid Black, 19"